We tested glass, plastic, and stainless steel French presses to find the best one for everyday use. It may not have the set-it-and-forget-it convenience of a drip coffee maker or the cachet of a pour-over kit, but if you're looking for a quick and uncomplicated way to make a great cup of coffee, the French press (also known as a press pot) is hard to beat. The best French presses have a simple design, but the marketplace is littered with all sorts of subtle variations on the form, each one claiming innovation and vying for supremacy: glass versions, plastic versions, stainless steel versions; press pots that are insulated or double-filtered or oversized. We spent two weeks brewing and plunging and sipping our way through a slew of well-regarded presses in an array of materials, shapes, and sizes. The goal: to find the best French press—one that produces a superior brew and can withstand intensive everyday use. Keep reading to see how the results shook out; for the specifics of how we tested and other models we considered, scroll to the bottom of the page. The Bodum Chambord was the first French press I ever owned, fresh out of college, and over the years it's one I've returned to again and again. Chances are, if you've ever ordered press coffee at a cafe, it was made in a version of the Chambord. Designed in the 1950s, the chrome frame and glass carafe are what most people envision when they picture a French press. But when I embarked on these tests I had to wonder: did the Chambord become ubiquitous because it really outperforms the pack? Or just because it has been around so long? When I lined the Chambord up with the rest of the contenders and put them all through the same tests, I was struck (and, I admit, pleasantly surprised) by how impressively it still held its own. The Chambord looks great right out of the box and its matte black polypropylene handle (which has a subtly retro look, like Bakelite) feels comfy and secure in the hand. The double-filtering combo of the fine mesh filter and perforated steel plate plunges smoothly and effortlessly into the carafe while still remaining tight enough to keep the coffee clean and grit-free. And that brew tastes really, really great: bright, clean, and balanced, but with enough body to remind you that you're drinking press coffee, not drip or pour-over. The press comes apart seamlessly after brewing and the pieces are easy to rinse and clean. The Chambord's Achilles' heel is its glass body, which comes with two downsides. One: if you're even a teeny bit klutzy you will eventually break it. That said, it's easy to replace: a spare beaker can be ordered online for just $20. The second drawback: glass has very little insulating power, so if you want to drink your coffee hot, you better start sipping as soon as it's been plunged. Or, just do what I do and transfer the fresh brew to a thermos to keep it warm. (Doing so also reduces the chance that the coffee will get bitter from sitting too long on the grounds.) Ultimately, given how reliable and attractive the Bodum Chambord is, and how high-quality the coffee is that it produces, neither of these things feel like deal breakers. A final note on price: compared to its competitors, the Chambord came across as a real value, delivering top-notch styling and serious coffee at a very reasonable cost. But it is possible to get an almost identical Bodum model, the Brazil, for more than half the price. The only difference between the two presses is one of form, not function: instead of a chrome frame, the cage around the Brazil's carafe is plastic. Our preference is to eliminate household plastic wherever possible, but if budget is an issue for you, the Brazil is a great buy. Remember when I said that if you're even a teensy bit klutzy you will eventually break the glass carafe? If you're particularly accident prone, consider buying a stainless steel French press instead. Stainless steel presses look sleek and feel a bit more company-worthy, transitioning easily from the kitchen to the dining table. Many, like the SterlingPro model, have the added bonus of being double-walled for insulation, so you don't have to worry about your coffee going tepid before the second cup. The drawback is that they also tend to be significantly pricier than their glass and plastic counterparts—but that's why we were intrigued to see how the SterlingPro, which is even cheaper than the Chambord, performed. We were skeptical at first. The SterlingPro is a clone of the more expensive metal presses, like the high-end Frieling, and is only available on Amazon. Even though it has over 2,800 five-star reviews, could the quality of the French press and the coffee it produced really measure up to models that sold for three times the price? Short answer: yes! In our day-to-day use of the contenders, the SterlingPro quickly rose to the top of the pack thanks to its durability and simple good looks, and the clean, consistent coffee it produced. The double-walled insulated 100 percent 18/10 stainless steel carafe felt good in the hand and cleaned up easily after brewing. (I hand washed it, but it is dishwasher-safe.) We also appreciated its extras, like clearly-marked measurements inside the carafe that make it easy to see how much liquid is inside, and an extra double-screen filter, should you want a replacement after years of use. Which is a good thing, because this is a press that's built to last. My husband and I have been brewing our morning coffee with a French press for close to two decades, so the process is already one of my everyday rituals. To get a feel for the contenders, I took a three-part approach: first I unboxed and cleaned each press and made some general notes about its design, size, and other physical features. Then, over the course of two weeks, my husband and I rotated each one into our morning coffee routine at least twice. We brewed a full pot our usual way, getting a feel for its strengths and weaknesses as a daily-use object and gauging how much we enjoyed our cups while we packed school lunches and ran for the bus. Finally, I did a controlled study of the entire group. In each press, I made four servings of coffee using medium/coarse ground Ethiopian beans and 205°F water, letting it steep for four minutes before plunging. I used an instant-read digital thermometer to note the temperature of the coffee just after brewing, tasted through the full lineup and compared each brew's cleanliness, strength, and clarity of flavor, then recorded the temperature again after 30 minutes to measure how much heat each press had lost and whether the insulated models really performed as advertised. 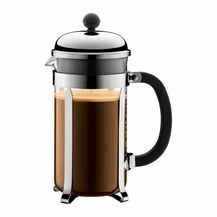 Is the French press well-built? How are the aesthetics? Upon unboxing each French press, we considered how it felt and looked. Is the body sturdy and solid in the hand? Do the materials seem high-quality? Does it look good on the table? Is it comfortable in the hand? Does it plunge smoothly and pour well? Related to feel, we also considered how comfortable brewing coffee with each French press was. Does the press feel balanced in the hand when pouring? How heavy is it when filled? Does the plunger work tightly and smoothly or does it jostle and squeak during use? Does the coffee stay warm for more than one cup? We seriously considered how long the carafes kept coffee warm. If you have to run to the school bus after your first cup, will it still be warm when you're ready for a refill? Does the coffee taste good? Is the filter effective at keeping the grounds and coffee separate? Or does the coffee have a muddy, gritty taste? Is it balanced? Or bitter and over-extracted? Is the press easy to clean? Do the components come apart easily? If you're going to use a press every day, you want it to be easy to clean. With that in mind, we paid attention to how hard the filter was to rinse, whether the carafe was easy to scrub, and whether the parts were dishwasher-safe. After studying a wide range of reviews, articles, and Amazon user comments, we settled on seven French presses to test across three categories: glass carafe, insulated stainless steel, and insulated plastic. In the glass category, the Espro P3, which has garnered lots of praise from critics and Amazon users, was the tightest competitor with our top pick, the Bodum Chambord, and after using it a few times, its charms were clear. The unique bucket-shaped filtering system did the most thorough job of separating the grinds from the brew of any of the presses we tested, yielding coffee that was bright and clean tasting, with barely a trace of sediment in the cup. The Espro's glass carafe was also slightly better at retaining heat than the Chambord's, keeping the coffee seven degrees warmer inside the pot after 30 minutes. But compared to the Chambord's chrome frame, the Espro's plastic frame and handle felt a bit chintzy and fell short on style points. Most importantly, the 32-ounce Espro P3 costs around $70, almost twice the price of the 34-ounce Chambord. Ultimately, while we were impressed by the Espro's performance, we didn't think the difference was dramatic enough to justify the disparity in price. 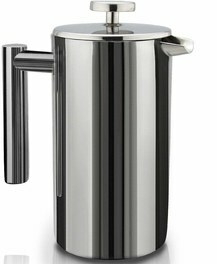 The Stelton EM French Press has a cool, Scandi-modern look for a semi-moderate price. We were intrigued by the possibility of combining the functionality of a press pot with the heat-retaining capabilities of a vacuum thermos, but the Stelton didn't live up to its promise and lost the most heat of all the insulated presses we tested. Though the Stelton is made from BPA-free plastic, if you're concerned about drinking hot liquids from plastic, or are just interested in reducing your use of plastics in general, our top-pick stainless steel press, the SterlingPro, brewed coffee that stayed warmer longer, at a lesser price. The Freiling Insulated Double-Wall Stainless Steel French Press is another favorite among critics and has hundreds of glowing Amazon reviews praising its luxe, insulated stainless body and the nuanced, light coffee it produced. We were impressed by the tightness of the seal around the filter—nary a particle of grit found its way into our cup—but that same tightness also made it a little awkward to use as we wrestled to get the plunger smoothly into the carafe. We also wondered if the Freiling's filter might be a little too effective: of all the models we tried, it produced coffee so clean that it tasted like pour-over. Which begs the question: if you're choosing a French press over a filter brewer, don't you want your coffee to have a little bit of body? The Frieling also costs about $100. During our tests, its inexpensive clone, the SterlingPro, performed nearly as well at brewing (and better at heat retention) at about a quarter of the price. If you want to make the best French press coffee at a reasonable price, get the Bodum Chambord. The kit is classic for a reason: it's simple, has timeless good looks, feels nice in the hand, and makes a terrific, clean- and complex-tasting brew at a fraction of the cost of many of its competitors. The only downsides are its fragility (the carafe is made of glass) and lack of insulation (though that can be addressed by pouring your coffee into a thermos once brewed). If you prefer the durability or look of stainless steel over glass, we recommend the SterlingPro, which outperformed similar models that were three times the price.